For the salad: Mix all of the salad ingredients in a large bowl and season with salt and pepper to taste. Refrigerate for 30-45 minutes before serving to allow all the flavors to mix. For the dressing: About 10-15 minutes before serving, prepare the dressing by mixing the avocado, mayo, sour cream and garlic. Mix well with a fork until it has a creamy consistency. Season with salt and pepper. Add the avocado dressing to the salad and stir lightly to mix the ingredients. Serve and enjoy! Always wear latex or plastic gloves when handling fresh peppers and always be sure to wash your hands when you're done. 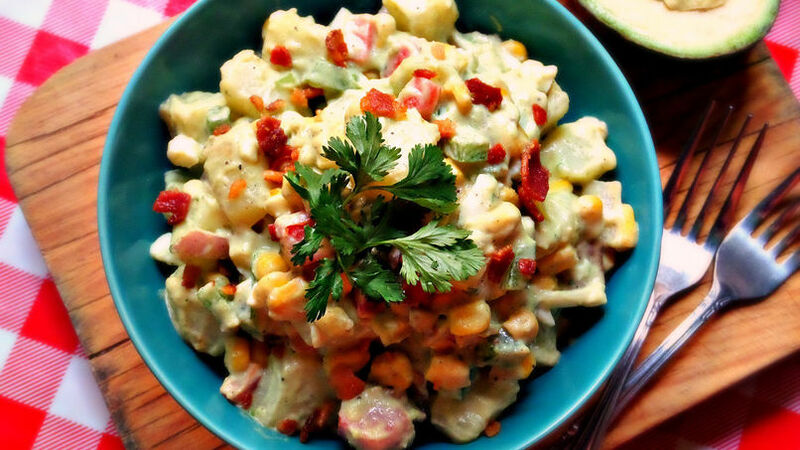 Potato salad is a classic dish that makes a perfect addition to any picnic or barbeque menu. Today we'll give the traditional recipe a Tex-Mex twist by adding corn, fresh cilantro, jalapeño and avocado dressing. I'm sure everyone will love the taste!